Windows remains the most popular and widely-used desktop operating system to date, and hence, has the largest chunk of user application software running on it. The nature of these applications ranges between games to multimedia to productivity and even development tools. For that reason, the operating system can tend to become unstable over time, especially if you try out a lot of software (without paying much attention to safety) and are not very conscious of your system’s health. Bottom line is, you may find yourself in need of reinstalling the operating system from time to time, and while with newer versions of Windows, the system stability has seen significant improvement, there will still be cases where you’d not be left with any other choice. For reinstalling Windows on your desktop or notebook, you need the serial key. Windows serial/product key is one thing that’s critical to all operating system installations, all the way from Windows 95 to today’s Windows 8. Even though some instances may reach halfway through the installation process, they’re bound to ask for the product key before you can finalize things. Traditionally, the license key would’ve come with the means of your acquisition of Windows installation media; if you purchased it online, it would come in an email. With retail boxes, you get the product key on the back of the box, and hence, it’s quite easy to utilize the key again to perform a clean install on your machine. The problem, however, arises when you have a PC which came preinstalled with Windows 8 – whereby you would find yourself lacking a key and hence, subsequent installs. There are a few elements that need to clarified to this story. For one, Windows 8 allows you to get back to a clean slate using its Reset PC Settings option (see: how to restore and reset Windows 8 to factory settings), which renders your computer in a state similar to when you took it out of the box. This eliminates the primary need for an operating system reinstall. Then, before Windows 8, those laptops that shipped with Windows 7, had the product key on the certification of activation on the underside of the machine itself. With Windows 8, the license key is built-in as a part of the BIOS/UEFI, and the operating system pulls that from the chip during first install and subsequent reinstallations. Hence, there is no easy way to retrieve Windows 8 product key from a preinstalled set up. Since the information is not readily available, you have to revert to a third-party source. For that purpose, Belarc Advisor is probably the best bet as it can be used as a safe product key finder for your system. It’s a free diagnostic utility for Windows (all versions) that will pull detailed hardware and software information about the PC that it is run on, alongside capturing the Product Key from the system registry. 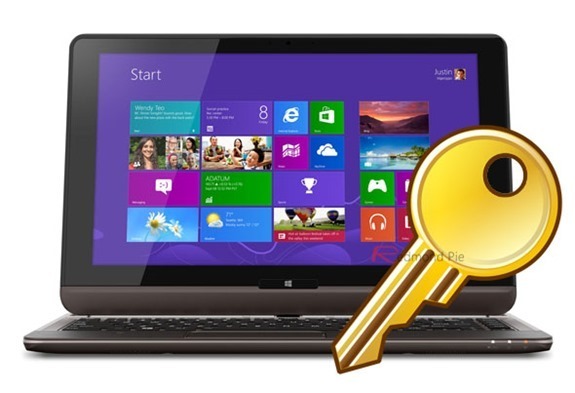 It is by far the easiest way to find your lost Windows 8 product key. The utility itself is rather small and poorly designed, presenting its results in the form of an HTML report inside your browser, but the amount of information retrieved is simply staggering. Within the software components, you’ll find your Windows installation along with the license key. While you may not need it for most cases, it’s still a good idea to have your Product Key stored in a safe location.